301 moved permanently ChiTown Fashionista: Chicago handbag designer Lisa Spagnolo launches "Flea Market"
Chicago handbag designer Lisa Spagnolo launches "Flea Market"
Over the past few weeks, local handbag designer Lisa Spagnolo has been sending out teasers for a new addition to her website. Entitled "Flea Market", I automatically assumed it would include vintage finds. However, I didn't know exactly what to expect. I mean, Lisa knows her handbags but I was curious to see how she would curate her online vintage shop. Well, the wait is now over! The Lisa Spagnolo "Flea Market" launched yesterday and is filled with some amazing pieces. I squealed with delight when I spotted the pleated chiffon skirt, the Calvin Klein dress and the leather pencil skirt shown below. Although they weren't in my size, I kinda wanted to buy them for somebody...anybody! The idea behind the "Flea Market" is this: while Lisa is travelling the world finding inspiration for her handbag line, she will also shop the markets for unique fashion and home decor treasures. So, although there are only a little over 20 items currently in stock, I'm excited to see what new things will be added to the shop in the coming months. I'm sure they will be nothing short of amazing. And speaking of amazing, check out the "Flea Market" introduction video. The model is simply adorable and the music is fantastical! Oh, and you'll get to see that pleated chiffon skirt in action. LOVE! Click HERE to shop the site. 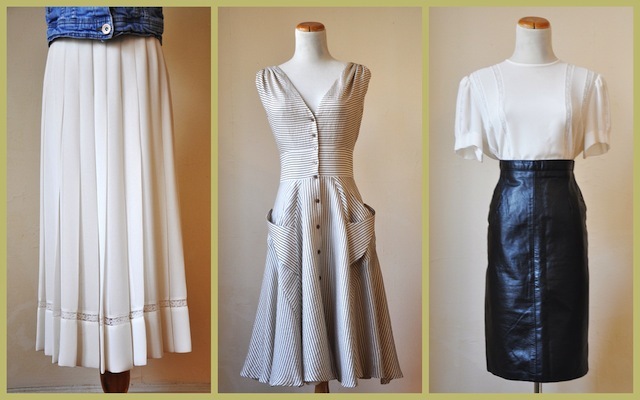 And while you're there, bookmark it for future "I need to get my vintage shopping fix" moments. I can't be the only one who has those....or am I? I've just been inspired! Now I know another way to wear my leather skirt, my fur stole, and fedora! Wooohoo!